These days, Madewell has been one of my go-to sources for fashion inspiration, key word "inspiration" considering I can maybe afford about half of what is already on sale... maybe. But oh, how that store likes to empty my wallet. As college students, shopping on a budget is a must, so here's a look from the Madewell Spring '12 lookbook I'm currently lusting after (one of many...) with some alternatives that are a bit more on the cheap. I really love the neutral palette of this look, especially seeing as how the monochramatic look is a major trend right now. affordable version of the Madewell piece. A tad obsessed with this ASOS safari-style skirt. it would definitely be an investment worth making. Now for the accessories: these shoes from Steve Madden are the perfect shade of peach and on sale (holla! ), are a great alternative to the Madewell look-alikes. 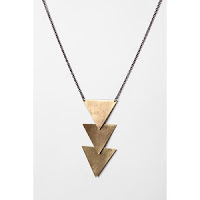 Also, kind of in love with this triangle-shaped necklace, following in the steps of the Madewell version and trend of geometric jewelry design.